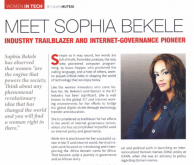 “Sophia Bekele has been in the news if not for promoting DotConnectAfrica’s bid for the DotAfrica geographical gTLD then in a controversial statement about the same. For the last 3 years she has been clear about one thing, DotConnectAfrica (DCA) is better positioned to manage the DotAfrica domain and they have put in a strong bid for the same.“ CIO EA 2012. Five years later the CIO EA May 2017 ISSUE, a key Business Leadership and Technology News Magazine , taking stock of Bekele’s decade of professional activities a nd achievements to date, in the ICT, DNS Industry, Internet Governance and Business and being an industry leader in her field, including her involvement, leadership positions and impact work in policy she has rendered to global organizations including multiple United Nations (UN) organs, ICANN and a number of others, named her an Industry Trailblazer and Internet Governance Pioneer! Simple as it may sound, her words are full of truth, from Ada Lovelace, the lady who pioneered computer programming, to Grace Hopper, who pioneered the coding language and a host of others, women played critical roles in shaping the world of technology that we enjoy today. Like the women innovators who came be-fore her, Ms. Bekele’s contribution in the ICT Industry has been significant. She is well known in the global ICT and internet working environments for her efforts to bridge the global digital divide through technology transfer and education. She is considered as trailblazer for her efforts in the world of internet governance terrain, where she has accomplished impactful work on internet policy and governance. While she is also known for her successful career in the IT and Internet world, her most recent work focused on introducing and championing the .Africa domain name for Africa. That became quite a journey in governance and an African story. The Reporter Daily, a prominent publication in Ethiopia also recognized her as one of “10 Women that Matter,” noting she is among the women who’ve “made their mark on society. Her proudest moment was recognition from a global language group in 2010 as a “Champion” of their very complicated cause, which entailed navigating through a highly technical and political path in launching an Internationalized Domain Names (IDNs) policy at ICANN, when she was an advisory to policy regarding domain names. With this in place, small businesses can register their own language at the URL level of the internet and reap the benefit under their own control rather under than western-owned registries, where some of the most successful new domains have launched. So where did all this start? Born and raised in Addis Ababa, the capital of Ethiopia, Ms. Bekele later left for the USA for her higher education. Ms. Bekele told CIO East Africa in an interview, that she studied Computer Information Systems for her undergrad and attained an MBA in the Management of Infor­ mation Systems. “I was then immediately recruited by a finan­ cial-industry giant, Bank of America, to train and perform in a unique field of IT, Auditing and Security, a highly ethical and disciplined field that deals with controls, safeguarding and governance of information systems as­sets,” she said. She spoke of a long, steady career in the field, moving around in various financial-industry . circles and consulting firms, until she took off to become independent, which started entrepreneurship journey. She set up various startups to pursue opportunities with assisting Africa address its digital divide while working with U.S. clients that needed services ranging from corporate governance, venture capital, corporate communications and developing business models to taking early-stage companies to market. Most of her startups were created to assist in technology transfers and bridging the digital divide at the time when Africa has an early need for building IT infra-structure. “My companies did well in the share of the market, handled important projects where we implemented large-scale fiber optic-based ICT infrastructure networking projects for high-profile regional clients in governments and businesses in Ethiopia. We also introduced the first Domain Name System (DNS) market in the country. As the industry consolidated, I kept up my interests and moved into emerging technologies using new startups”. Ms. Bekele attributes her success in the industry to three major things; having a growth mindset; flexibility; and bouncing back from setbacks. So, how did she end up in the IT industry, which is dominated by male counterparts? Ms. Bekele said that her educational background, training and employment experiences determined her career. “It is actually an exciting and ever changing industry with many challenges and new things to learn, particularly in the financial industry, where technology was always at a cutting edge, so I was passionate about my work. When I started, it was pretty new for women, but I went on it like any other responsibility, like I still do now, ignoring the gender stereotype;’ she said. As the founder and director of DotConnectAfrica, Ms. Bekele walked us through how she got that project started. “ Most recently twenty-five women selected from over three hundred applicants benefit directly by receiving training on mobile apps and technology”, she said. Miss.Africa started as an initiative targeted at young women in Africa to increase their involvement in early technology use and adoption with a view to improving their digital self-awareness and empowerment, and self-esteem, Ms. Bekele said. “We achieved this through in-house training and mentor-ship,” she added.“We have now moved on to organize a pan-African seed fund where we offer grants to support women and girls in the Science, Technology, Engineering and Mathematics (STEM) fields to launch or expand their own initiatives that will increase their digital opportunities in IT related training, jobs and leadership roles“. Under DCA, Ms. Bekele explained that they provide other digital programs including targeted online industry channel and video-dissemination services and other on-demand technical services to the general public. Challenges? Yes just like her male counterparts. Ms. Bekele pointed out the main challenge as a woman CEO is running an organization to an optimum with the vision and mission set out and the resources allocated. “Second, the challenge of being a woman in tech is obviously to overcome some of the gender-bias where the male fraternity tend to lean towards the club mentality even as a means of get-ting over you. But I think it has become societally unacceptable now more than ever to not have the gender balance. And companies are realizing the danger of ignoring the unique talent women bring to the table, to their bottom line;’ she said. She pointed out, though, that by and large it’s well known that women represent the larger consumer group so the issue at stake is more than just equal opportunity, but survival of the fittest companies. In addition to her IT-related accomplishments, Ms. Bekele has written about women’s issues and development is-sues. Most of her recent writing has been associated with expressing her views on internet-governance matters and the related public issues. She pointed out that ICT is the lynch-pin of innovation and economic value, which is to say that roles are being shaped daily by changes in technology, so women should appreciate it, get into the groove of knowing its value a nd use it well. The Internet Business Council for Africa (IBCA) has opposed the proposed rules on Net Neutrality by the Federal Communications Commission (FCC).